What does the term "any two cards" mean in the world of poker? 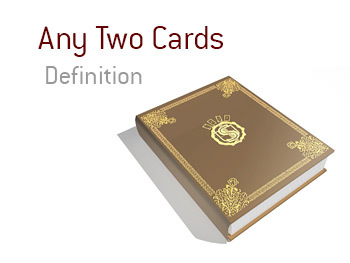 What is meant by the term "any two cards"? In poker, "any two cards" comes to refer to a situation in which it does not matter which two cards a player is holding, as they will be making the same decision regardless. For instance - let's say that you are playing in a live poker tournament. Your stack has been whittled down to almost nothing, and the upcoming blinds will take out a good portion of your stack. You are in early position. You decide to push with "any two cards", hoping that everybody decides to fold, giving you the blinds and antes. This is a better option, you decide, than getting blinded off. By being aggressive, you are hoping that you can induce others to fold with marginal holdings so that you can begin to build your stack back up. Another case when the term "any two cards" could be used: let's say that you are playing heads-up against another player and you have their tells completely figured out. Thanks to this information, you feel as though your own cards are irrelevant, as you will easily be able to push the other player off of hands based on his tells. In this case, "any two cards" is all that is needed to win any hand that you wish.